Landmarks is a regular feature about historic sites, buildings and monuments that often go unnoticed – signposts for our local history that tell a little bit about us and the region’s development. If you have a suggestion for the Landmarks column, contact Stefanie Pettit at upwindsailor@comcast.net. Read an earlier Landmarks column about the Frequency Changing Station at spokesman.com/stories/2012/apr/05/salvaged-history/. 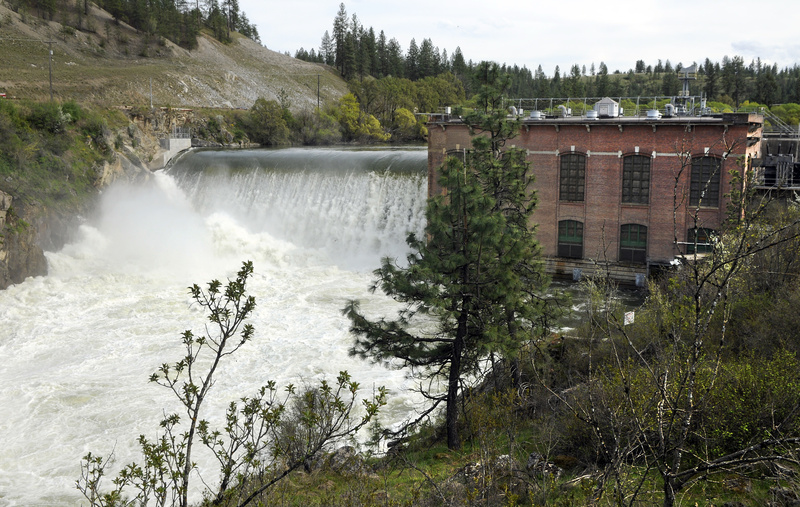 The 16 miles from downtown Spokane to the Nine Mile Falls Dam on the Spokane River was once considered such a long journey that a little village was created on site for the power plant workers and their families. Today that whole enclave – the dam, powerhouse, 10 family cottages, a 30,000-gallon metal water tank (believed to date from the 1920s) and a one-story gabled storehouse – constitutes the Nine Mile Hydroelectric Power Plant Historic District, which was placed on the National Register of Historic Places in 1990. Spokane’s growth in the early 1900s was shaped by the electric streetcars and interurban rail lines that would eventually have 250 miles of track connecting the city to the Palouse country and Coeur d’Alene. The lines provided freight service for farms in the region as well as passenger service – all under the umbrella of the Spokane and Inland Empire Railway System. The Spokane Power Development Co., owned by mining entrepreneur J.P. Graves, gained sites along the Spokane River to develop a power supply for the rail system, and in 1906 began construction of the $1 million, 12,000-kilowatt hydroelectric plant in a rock canyon at the Nine Mile Bridge for the rail system that at the time contained 130 miles of track. The river had to be diverted from its natural channel, which was accomplished by building a concrete gravity dam in which the powerhouse itself was part of the water-stop system – apparently the only such structure in the state. The dam, built of cyclopean masonry (large blocks of granite set in concrete), measures 363 feet across the top and is 58 feet high; and it provided room for placement of 10-foot flashboards atop the spillway during the water-storage season to increase its height and storage capacity. The integrated three-story powerhouse measures 116 feet (north-south) by 139 feet (east-west) and is supported by buttress walls. It has four gates in the wall on the upstream side through which water flows through to turbine chambers. Each gate covers openings that are 14 feet wide by 20 feet high. The plant was completed in July 1908, at which time it was connected to the company’s distribution center in Spokane, known as the Frequency Changing Station, by high tension transmission lines. From there direct current powered Spokane’s streetcar system, and a portion of the power was converted to alternating current for a series of substations located along the railroad’s routes. The Nine Mile Plant also furnished power to small communities along the rail lines, beginning with the town of Rosalia in 1908. In 1925 the plant was purchased by Washington Water Power Co. (now Avista), making it the sixth plant it owned along the river. In 1928 and 1929, WWP erected 10 small brick homes in the Craftsman and English cottage style in order “to provide housing for its personnel at the remote location,” one document reads. Each of the cottages had three bedrooms, a bathroom, kitchen and living room. Steve Wenke, who is today the chief generation engineer at the Nine Mile power plant, grew up there and remembers it as a tight-knit community set among cottonwood, willow and black locust trees. He also recalls carrying lunch to his father, a dam operator, at midday. Today several of the cottages are occupied by rangers who work at Riverside State Park, the 7,600-acre recreation area which borders much of the power plant site, and a number are vacant. Avista spokesperson Anna Scarlett said the plant now has a 26.4 megawatt capacity when all four Francis turbines are running, enough power to supply electricity for 19,500 homes. And there have been numerous improvements over the years, not the least of which is the installation of a spillway with a modern spill plate (no more wooden flashboards to increase the amount of water stored behind the dam) in 2001. Still, a walk through the area is evocative of those earlier days, when Nine Mile was truly remote. Today kayakers and other water and hiking enthusiasts can be seen enjoying the surroundings. It remains one of the best-preserved older hydroelectric plants and one of the most significant of the remaining properties connected with interurban rail history in the state.